I love spending time in the kitchen with my nieces (baby nephew is still a tad too young for cooking). 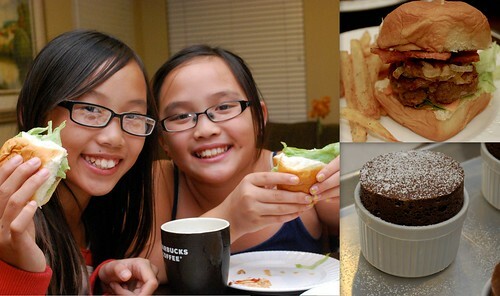 The older ones are at the “tween” and “pre-teen” age and cooking/baking has been a wonderful time for us to catch up and bond. I recently had a “Girls Night” with them–Dinner, Dessert, and a DVD. 🙂 They had the chance to choose whatever they wanted to eat for dinner, pick up the ingredients at the store, and then prepare it. Not only did it give them the chance to see exactly what went into the food they were eating but they were able to celebrate in the success of creating a delish meal! If you’re new to Soufflés, I really suggest trying the recipe below from Zen Can Cook. It’s quite straight forward with wonderful results. The only edits we made was the addition of a pinch of Cream of Tartar when whipping the meringue (for extra stability) and serving it with my Raspberry Sauce versus their Creme Anglaise. I personally think the tartness of the Raspberry Sauce is a wonderful pairing for the deep set chocolate flavor—allowing the overall dessert to not be too sweet. And if by chance you find yourself with a Soufflé or two leftover, fear not! Pop the ramekin into the microwave and warm for about 10-15 seconds. 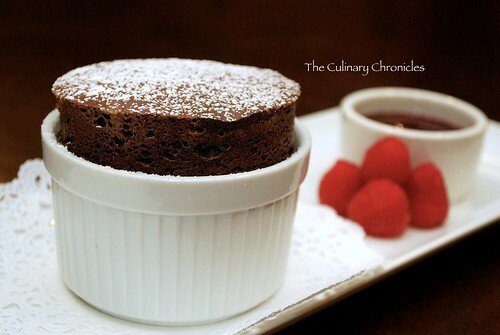 Invert the Soufflé onto a plate and serve with a scoop of vanilla bean ice cream and drizzle of raspberry sauce. And there you have it–-Warm Chocolate Cake a la mode! Just as delish and surprisingly, still light and fluffy! Place all raspberry sauce ingredients in a medium sized, heavy saucepan. Simmer on medium-low until berries have broken down and the wine has cooked off. Approximately 10-15 minutes. Let cool. Preheat the oven to 375 degrees. Use a pastry brush (or your fingers!) to coat the inside ramekins with softened butter. Fill the mold with granulated sugar, and then pour out the excess. Pour the half-and-half into a saucepan and heat over medium high heat until bubbles begin to form around the edge of the pan. Remove from the heat and make a ganache by adding the chopped chocolate. Stir well until combined and all of the chocolate has melted. Make a double-boiler by setting a large mixing bowl over a pot of boiling water. Place the ganache in the mixing bowl, add the cocoa powder and water, and whisk until very hot. Remove from the heat and set aside.Place the egg whites in a large mixing bowl and whip on medium speed until foamy. Add Cream of Tartar. Increase the mixer speed to medium-high and make a French meringue by adding the sugar 1 tablespoon at a time and whipping the whites to stiff but not dry peaks. Do not over whip the egg whites! You can tell the egg whites are over whipped if they start to separate and resemble scrambled eggs. Use a rubber spatula to gently fold about half the meringue into the warm chocolate mixture. Then fold the chocolate mixture into the remaining meringue, being careful not to deflate the batter. The soufflé mixture should be homogeneous in color, but if you still see streaks of meringue in the batter, that’s okay. Use a large spoon to gently place the soufflé mixture in the buttered and sugared mold. Fill to about 1/4 inch below the rim of the mold. Run your thumb around the rim to remove the excess butter and sugar. Bake until the soufflé has risen to about 1 1/2 half-inch over the rim and starts to brown on top, about 12 minutes. Remove from the oven and dust the top with powdered sugar. Serve immediately with a side of Raspberry sauce. Nina and Stephanie with their creations. Next Post Potato Mushroom Gratin–PERFECT for Thanksgiving! I love souffles but have never tried making then. You sold me, I will make them soon. Your two nieces are real cuties! WOW! Souffles are tough because so many people have a hard time getting it to rise correctly. You did a GREAT job! i’m bummed. i did not get to try these! but, they sure look tasty! Can these be prepared a few hours in advance and held in the fridge before baking?